Wow, I'm so excited. My followers moved to over 100 yesterday. Thank you!! I feel so honored especially since most of my followers are not my family and friends I met elsewhere--not from Crafty Moms Share. Also we have 90+ posts shared at Sharing Saturday. It is still open, so please go check it out and share something with us. I am always amazed at everything and love to see what wonderful things people are up to. I often try some of them with Hazel as well. 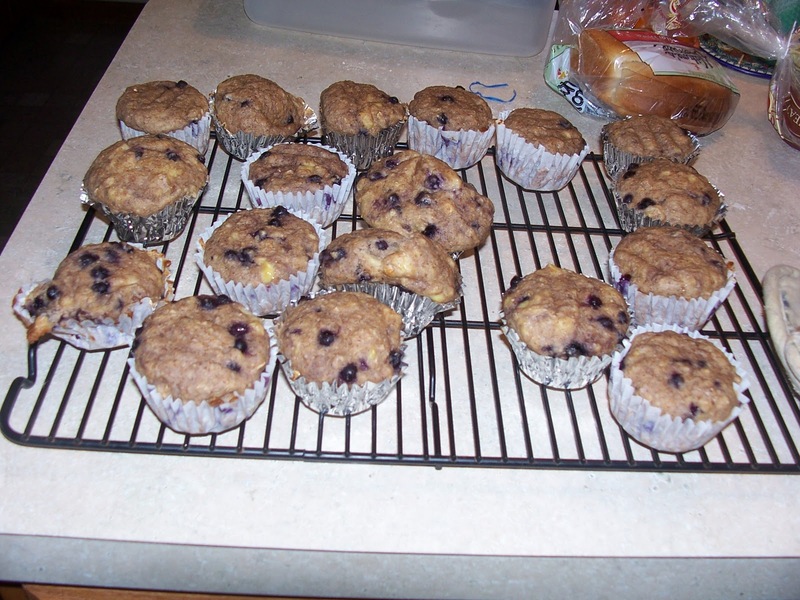 So this weekend, we baked some muffins. 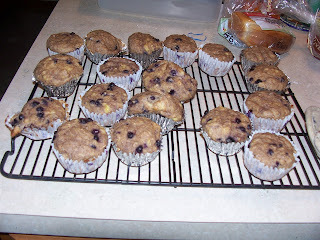 We made Banana Blueberry Muffins since we had some overripe bananas to use up. Hazel is a great banana masher. 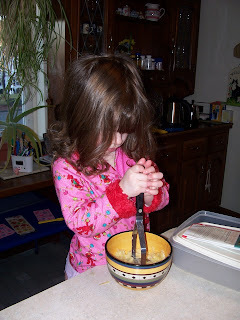 She also did most of the mixing and helped scoop them into the muffin tins. Our recipe is pretty low fat and healthy!! In large bowl beat egg and then add milk, yogurt, bananas and oil and mix. Then add dry ingredients and mix well. Then add blueberries and stir. Scoop into the prepared muffin tin. Bake for 20 minutes and then cool on rack for 10 minutes before eating. We also did a craft of sorts. I had been saving a Tropicana juice bottle. I love the shape and thought it would be a fun playhouse for some of Hazel's dolls. I asked Steve to cut a door in it. Then we glued some double folded bias tape around the cut so there wouldn't be any sharp edges. Then we moved Hazel's Caillou figures into it. I think Hazel and I may decorate it more, but it at least gave her a playhouse for the figures. I hope you are having a wonderful weekend! I know I'm excited to have my quilt done and have been working on Hazel's. And have been enjoying some family time. Hi Carrie! The muffins look delicious! Happy to be your newest follower! 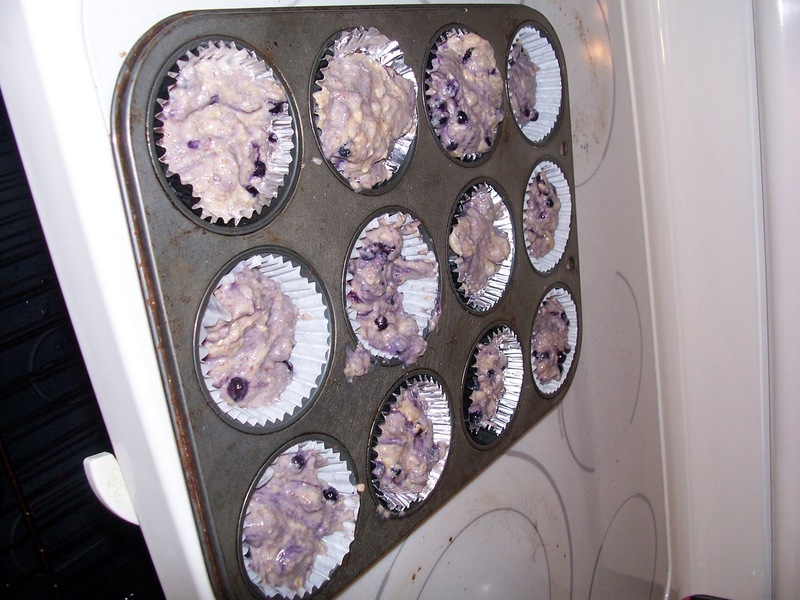 Yum, the muffins look very good! What a cute idea of a playhouse, it looks perfect for these little figures, how fun. 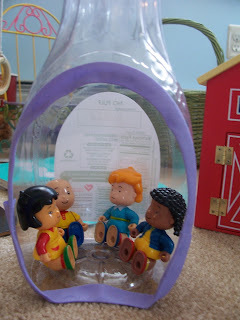 I will have to save some of my bottles, very neat idea!! Yumo! 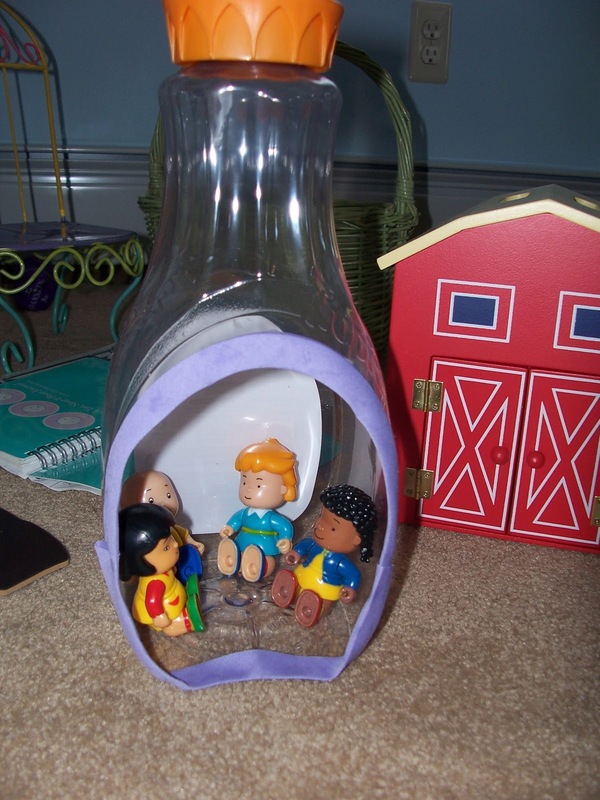 Thanks for linking them :-) And what a clever little house for Hazel's toys!